Peel and chop onion and garlic. Cut sundried tomatoes into small pieces. Thinly slice zucchini lengthwise with a vegetable peeler. In a large saucepan, heat olive oil on medium-high heat and fry onion and garlic for approx. 1 – 2 min., or until fragrant. Add ground beef and bay leaf and continue to fry for approx. 5 min. more. Deglaze saucepan with red wine, add crushed tomatoes and simmer for approx. 5 min. stirring occasionally. Add sundried tomatoes to sauce and stir to combine. Add ricotta, some of the mozzarella, and parmesan to a large mixing bowl and season to taste with salt and pepper. Preheat oven to 200°C/400°F. 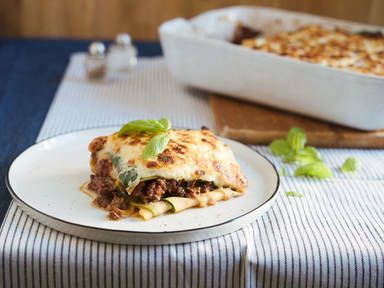 To assemble the lasagna, spread a third of the ragu over the bottom of the pan, top with a third of the zucchini strips, then sprinkle a third of the cheese mixture on top. Continue layering in this pattern until you are out of ingredients. You should finish with the cheese mixture on top. Sprinkle with remaining mozzarella and Parmesan. Bake in the oven for approx. 30 – 40 min. at 200°C/400°F. Cut into portions, serve, and enjoy!